A Vietnam vet turned P.I. ends up in the wrong place at the wrong time – at the Jewel Arms apartments in St. Louis, as he matches wits with a ruthless killer. Elvin Suggs already knew how to be in the wrong place at the wrong time. Decades earlier, spending time as a Green Beret during The Siege of Khe Sanh taught him about the wrong side of 1968. Now with his life in a shambles after his wife demands a divorce—brokenhearted and broke but determined to salvage his pride and his dreams—Elvin turns to the only person he can count on, Dimond Redding, his best friend’s widow. A fellow ’Nam vet and new tenant at the Jewel Arms apartment building in St. Louis, Missouri, Dimond is ready to move out before Elvin even arrives when a random murder occurs right outside her front door. She can’t break her lease, but with a ruthless killer on the loose and corpses suddenly turning up everywhere, she wonders if she’ll be the next victim. Homicide Detective Rick Valentino doesn’t seem to be getting anywhere fast on the case, so experienced Private Investigator Elvin lends a hand, working to put the pieces of the puzzle together. The odd assortment of tenants and strange goings-on at the Jewel Arms provide more questions than answers, including connections with Elvin’s past. When another car with Tennessee plates shows up at the apartment building is it a coincidence, or is someone following him? As Elvin inches closer to the truth he has to remind himself that he knows all about the wrong places and times. 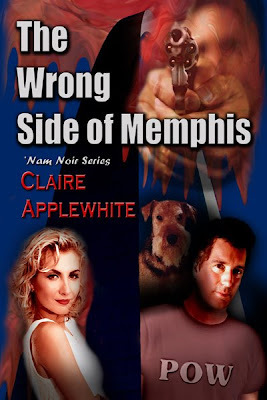 Only this time he's got nothing to lose—he’s on the wrong side of Memphis. To see a larger version of the book's cover and to find out how to get a copy, visit The Wrong Side of Memphis on our L&L Dreamspell website!